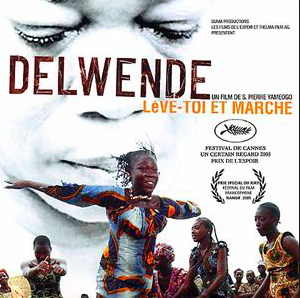 Delwende draws on a true story of a mother and daughter who are accused of witchcraft following the death of a boy who had meningitis. Despite the knowledge that there is an epidemic of meningitis throughout rural areas of Burkina Faso, Napoko Diarrha is accused of eating the boy’s soul. The rumor of her witchcraft is disseminated by her husband, who is angry with her because she disagreed with the idea of marrying their daughter off. Fearing for her life, Napoko flees to a nearby town before her trial can take place. Just as Napoko is losing hope, her daughter Pougbila meets her in the neighboring town and they attempt to escape the traditional and male-dominated society. Catsoulis, Jeannette. “In Burkina Faso, Rebellion Stirs.” The New York Times, The New York Times, 7 Oct. 2008, www.nytimes.com/2008/10/08/movies/08delw.html. Curiel, Jonathan. “'Delwende'.” SFGate, San Francisco Chronicle, 9 Feb. 2012, www.sfgate.com/movies/article/Delwende-3187710.php. Weissberg, Jay. “Delwende.” Variety, 13 May 2005, variety.com/2005/film/markets-festivals/delwende-1200525893/.